This is probably one of my favorite color combinations - Citrus Leaf, Ocean, Orange and Black. If I'd wanted something a bit more girly I would add in some pink but my daughter is more of a blues and greens girl than pink. Just this morning my youngest (8 yrs old) was telling me how when he grows up and gets a girlfriend he'll want her to be like this sister - pretty but not girly, smart and focused on school, fun and must like video games. All I can say is that whoever my boys decide to marry, that girl will have some big-sister shoes she'll have to fill. I just love how much my boys love their sister! The center of the flowers have a little "ball" of orange sassy strands rolled up and adhered with liquid glass. 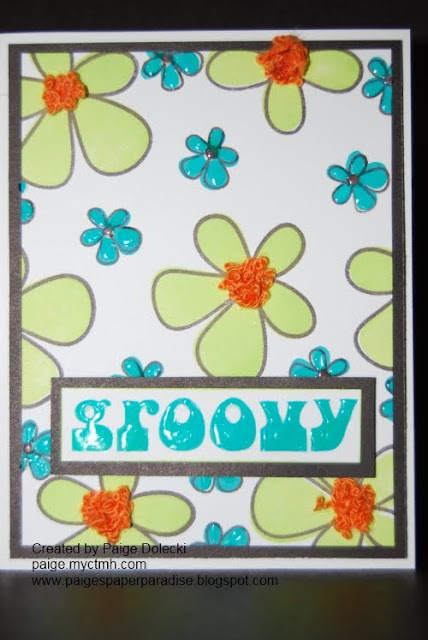 I've also given some liquid glass shine to the word "groovy" and the little blue flowers. Liquid Glass is just one of those must-have products. I even use it to fix toys for my kids!